Cara is searching for a girl in her class named Elsie that no one seems to remember. Elsie, however, seems to show up in every photograph that Cara owns and Cara wants to know why. 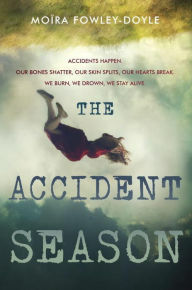 It is also the beginning of the "accident season" when Cara and the members of her family are subject to an unusual rash of accidents that always seem to strike them in October. Undeterred by falling bridges and collapsing bookshelves, Cara goes ahead with her plans for a Halloween party at an abandoned house, which somehow seems to evoke the spirit of Elsie. A really strange paranormal story. I liked the way it was heading (even if I didn't understand every scene) but it got steadily weirder and weirder. By the end, it simply ceased to make sense and lost me entirely. Perhaps I didn't give it the attention it deserved, but once lost in the plot, I lost interest in the story. Nice writing but a story that went from poetic and lyrical to ridiculous and illogical. Skip it.